Lighter and Local: Nutella Sea Salt Fudge, Chocolate Rolo Cookies and Chocolate Kissed Prezels, Oh MY! Nutella Sea Salt Fudge, Chocolate Rolo Cookies and Chocolate Kissed Prezels, Oh MY! Merry Christmas Eve to all those who celebrate it! For all of you who don't know, my day job is being a television news producer in Boston. Other than the husband, my dear co-workers help me test all my products out. Truth be told, they get my baked goods because I cannot have them sitting in the house, looking at me. I am so lucky to have a staff of amazingly talents producers and writers than I'm honored to work beside each and every night. I wanted to thank them in some small way. I decided to give them the gift of sweets this holiday season. I also wanted to try out some new recipes I had stumbled across in my trusty Google Reader. Now, before I continue on this Christmas Eve, I would like a moment to wish you and yours a very happy holiday season. Whatever it is you celebrate (or don't), I hope you're happy and healthy and with friends and family. Since starting this journey on this blog, I've met some amazing people and have touched a lot of people I still have had yet to meet. I hope you enjoy this little corner of my life, I certainly enjoy bringing it to you! Now, to food: All three of these lovely treats were a favorite of someone in the newsroom at some point or another last night. I promised I'd post all the links (and my thoughts) to the recipes because they really are fabulous. While you check these beyond yummy recipes out, also check out the blogs they're attached to, there's some amazing work in the below sites, and they'll leave you hungry. Let's start with that Nutella Sea Salt Fudge you see above. I found this little gem on the great blog "Cookin Canuck: Nutella Sea Salt Fudge". Dara is the author of the site, a mom of two cute boys, and very talented in the kitchen. She wasn't kidding when she said this comes together easily and is super impressive. Just leave yourself enough time (about 2 hours) for the fudge to cool in the fridge. I doubled the recipe and poured into a 9x13 baking dish which worked perfectly. Do NOT skip the parchment paper step, it makes this all SO much easier. Do not walk, but RUN, to the store to get everything you need for this recipe. I love me some Rolos. Seriously, ask the husband. When we head north (to Canada) to visit family and friends, I buy anything Rolo related (especially the ice cream). Yes, you can get those chocolate/caramel pieces of heaven in the U.S., they just don't put it into all kinds of treats here like they do in Canada (and don't get me started on the lack of Coffee Crisps down here). I digress. After a bite into one of these cookies, my anchor proclaimed, "That might be the best cookie I've ever had". I can't disagree, it's up there. You bite into what you think is a chocolate cookie to get the Rolo surprise in the middle. 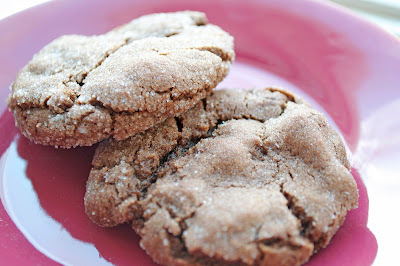 I found this recipe on "Two Peas and their Pod: Rolo Cookies". The blog is about the cooking adventures of Utah couple, Maria and Josh. I have a TON of their recipes bookmarked. Check the site out and I'm sure you'll do the same. The only thing I'll add to this recipe is that it's TOTALLY adaptable. I used mostly Rolos in the middle, but also did a batch with Peppermint Patties and Miniature Reese's Peanut Butter Cups. All three came out amazing. The husband especially liked the Reese's one. My biggest hint with these cookies is to completely cover the candy with the dough. You get a larger sized cookie with this recipe, and hey, it's the holidays - that's OK. Enjoy with a tall glass of milk please! Chances are you've come across these in the past. A LOT of people make some variation of these sweet treats. It's totally understandable too because they're super easy and basic and totally yummy. Get that oven to 350 degrees. Line a baking sheet with parchment paper (which, by the way, is NOT wax paper. Don't put wax paper in the oven, it burns and smells awful). Now place as many pretzels as you need or want on that lined baking sheet. 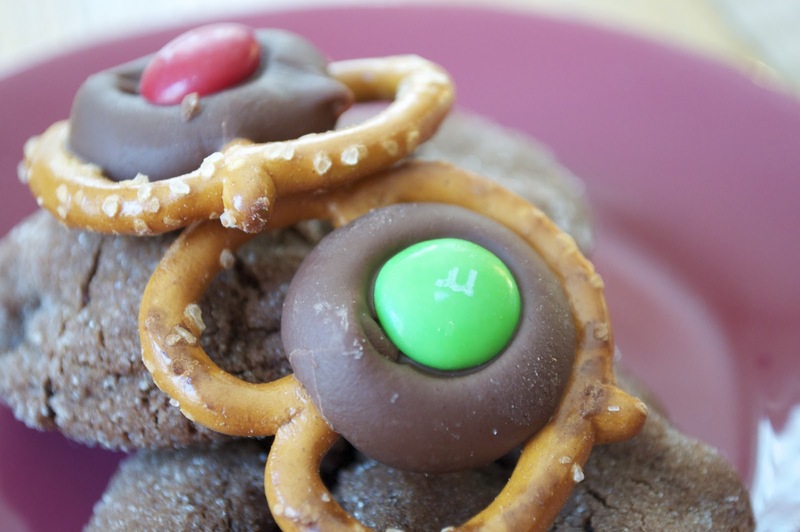 Place a Hershey Kiss (or Rolo, or any small candy really) on each pretzel. Pop them in the oven for 2 minutes until soft, but keeping their "kiss" shape. 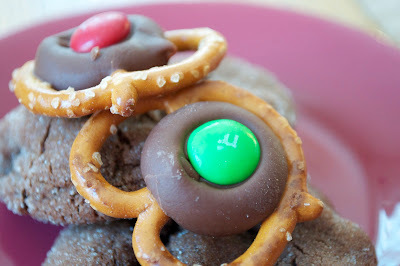 Take those yummies out of the oven, press a little M&M into each and throw them in the fridge to harden up. Once they've cooled, you can pretty much throw them into any kind of container you'd like and they'll last for a week or so (but I highly doubt you won't eat them by then). Hey Kimmy -Merry Christmas from a fellow curlytailer! i've used the small square pretzels for the rolo pretzels and then pushed a whole pecan to smoosh the melty rolo - delish! The gift of sweets is a really good gift! :) I'm sure they loved your presents! 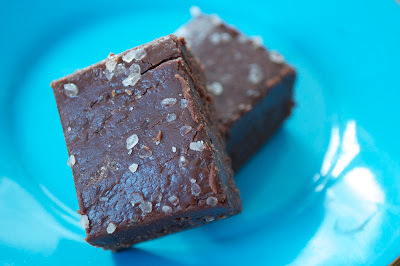 Salted Nutella fudge sounds absolutely AMAZING! I'm just catching up on my google reader and oh MY do these look good! Every last one of them! I hope you had a very Merry Christmas! I'm so glad you enjoyed the Nutella fudge. It became an instant favorite in our house. I've had my eye on Maria's cookies, too.